The Hamburg social enterprise More than Shelters builds flexible refugee accommodations and is working on improved living spaces for people in need. In view of increasing numbers of refugees, new spatial concepts are in demand – not only in Nepal, Jordan and Greece, but in Germany as well. A mobile clothing dispensary at the Hamburg central train station supplies refugees with shoes, jackets and blankets. 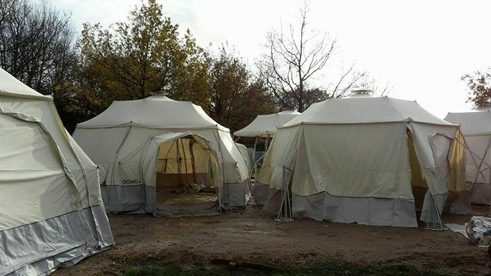 Temporary emergency shelters on the Greek island of Lesbos house people from Syria and Iraq who have barely survived their flight across the Mediterranean. And a boarding school in Nepal enables children to learn together once again in the aftermath of the earthquake of spring 2015. 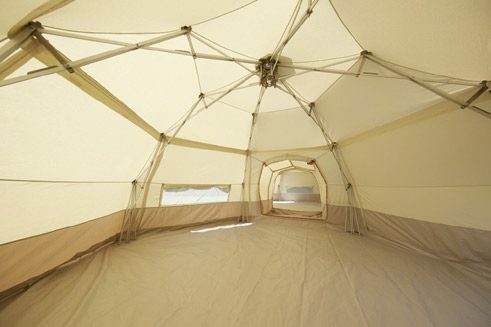 All three locations have one thing in common: they consist of Domo modules: flexible modular tent systems with foil flooring, a supporting structure and a waterproof outer surface that can be quickly adapted to a range of climatic conditions and cultural needs as required. The social enterprise More than Shelters, specialists in design and architectural concepts for humanitarian purposes, has developed and constructed Domo. Artist Daniel Kerber founded the firm in 2012 in Hamburg. Since then he has been working full-time on shelters for people in need, together with an interdisciplinary team of ten members. Kerber had already worked with informal architecture and improvised spatial design in his art installations that were to be seen in Tokyo, Berlin and New York. 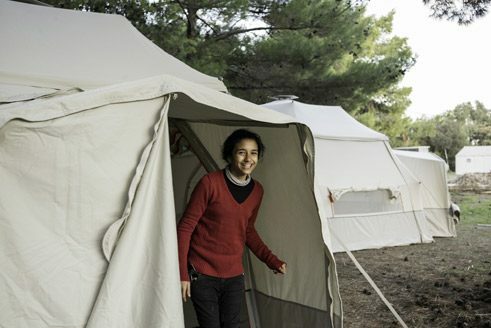 On his research trips he noted that the very same standardised tents stand in all refugee camps in the world – regardless of heat or freezing temperatures. And something else bothered Daniel Kerber about the standardised accommodations: they allow the refugees scarcely any options for shaping and improving their living space themselves. “By contrast, our approach is to include users from the start. They can adapt the individual Domo modules according to their wishes and needs. The layouts can be altered and expanded as needed,” explains Isabelle Poncette. 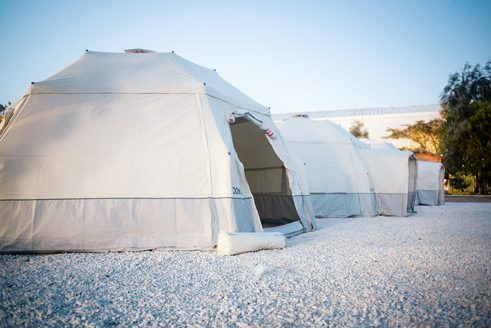 The anthropologist is More than Shelters’ humanitarian project coordinator and is familiar with local conditions. 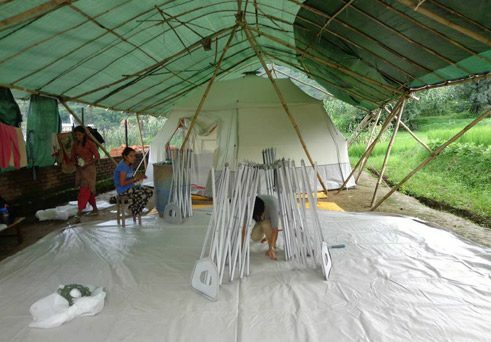 In Nepal, for instance, the Domo modules have been supplemented with bamboo constructions that serve as monsoon roofs. However, the crux of the matter involves not only architectural adjustments, but also designing community life under the difficult conditions prevailing in refugee camps. This means concretely: More than Shelters offers not only flexible accommodations, but also “innovation consultancy,” as Isabelle Poncette describes this service. Za‘atari in Jordan is one of the world’s largest refugee camps; approx. 80,000 people from Syria have sought refuge there. More than Shelters is working on a recycling pilot project there for the organisation Oxfam. The idea is for refugees to sell recycled rubbish to Jordanian dealers, earn some money by doing so and thereby enter into an exchange with Jordanian society. Whether this will work out remains to be seen. Immediate aid in crisis areas – a roof over one’s head, food, basic medical care – are obviously still necessary, says Poncette. It is, after all, mostly a matter of life and death. But the emergency services with their well-coordinated logistics are no longer enough. We have to go a step further and in collaboration with the people affected and the aid organisations develop new approaches and perspectives for life in refugee camps. She may well be right in view of the figure that the UN High Commissioner for Refugees (UNHCR) has cited: a refugee stays an average of twelve years in a camp. World-wide, increasing numbers of people are fleeing violence, war and persecution. In 2015, approx. 800,000 sought refuge in Germany – and need homes. To date, Domo modules have not been used for housing purposes, but as social spaces instead: as clothing dispensary and tea room at Hamburg’s central train station, as safe, private spaces for women and children in Hamburg’s initial accommodation facility, as a community room in Bremen. But the need for living space is growing. The municipalities responsible for accommodations are repurposing increasing numbers of warehouses and factory buildings as emergency housing. In such cases, the More than Shelters team recommends the “space-in-space” concept using flexible Domo modules that enable safety and privacy and thus peaceful community relations. 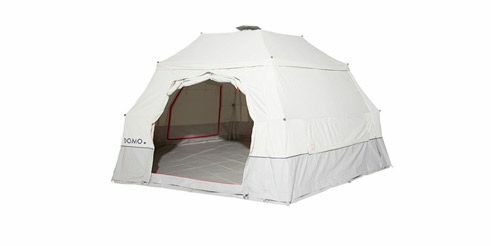 In addition, the social enterprise’s architects, designers, engineers and researchers are at work on Domo Arctic, a winter-proof model suitable for outdoor use in Central European winters.